Hosseini Hamedani, F., Rahimifard, N., Mojab, F., Bagheri, F., Pakzad*, S. (2017). Evaluation of safety of Hammada salicornica in cell culture. Research Journal of Pharmacognosy, 4(Supplement), 3-3. F. Hosseini Hamedani; N. Rahimifard; F. Mojab; F. Bagheri; S.R. Pakzad*. "Evaluation of safety of Hammada salicornica in cell culture". Research Journal of Pharmacognosy, 4, Supplement, 2017, 3-3. Hosseini Hamedani, F., Rahimifard, N., Mojab, F., Bagheri, F., Pakzad*, S. (2017). 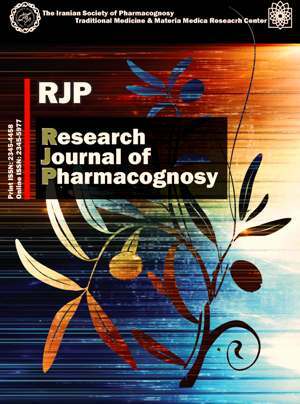 'Evaluation of safety of Hammada salicornica in cell culture', Research Journal of Pharmacognosy, 4(Supplement), pp. 3-3. Hosseini Hamedani, F., Rahimifard, N., Mojab, F., Bagheri, F., Pakzad*, S. Evaluation of safety of Hammada salicornica in cell culture. Research Journal of Pharmacognosy, 2017; 4(Supplement): 3-3. 1Pharmacy Sciences Branch, Islamic Azad University, Tehran, Iran. 2Microbiology Lab, Food and Drug Control Laboratory, Ministry of Health, Tehran, Iran. 3Pharmacy Faculty, Shahid Beheshti University of Medical Sciences, Tehran, Iran. 4Biologicals Lab, Food and Drug Control Laboratory, Ministry of Health, Tehran, Iran. Background and objectives: A pharmaceutical products that is planned to be used in clinic, should not only have beneficial effects but also be safe too. Preclinical studies in animals are costly and need considering ethical issues. Cell culture can be used before animal tests. Considering useful effects of these methods, we have evaluated safety of total methanol extract of Hammada salicornica and its aqueous and petroleum ether fractions in cell culture.Methods: Total methanol extract was prepared with the standard method of maceration. Different fractions were prepared by liquid-liquid fractionation and the extracts were then dried with rotary evaporator. After determination of bactericidal concentration of the extracts, 400 ug/mL, the cytotoxicity was tested at various concentrations regarding the minimum antibacterial concentration by MTT test. Hep-2c and VERO cell lines were used in MTT test. A range of concentrations (10-500 ug/mL) of the extracts were prepared and were added to about 70% confluent 96 well plates. After exposure for 48 h, MTT solution was added to the wells, and 4 h later formazan crystals were solubilized and optical densities were read at 570 nm. Results: Cytotoxicity Index was calculated and significance test was performed using t-test comparing the Index of the test and control group at each concentration. No significant difference was observed. Conclusion: Various fractions of H. salicornica were not cytotoxic at concentrations above bactericidal concentrations (up to 500 ug/mL). The results need to be confirmed in animal studies before using in human subjects.